The phase function panel is one of the plots of the Mie Simulator. 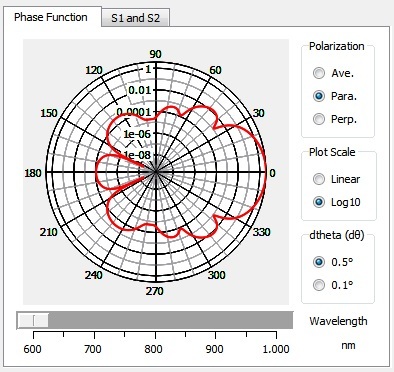 The user can plot phase functions for wavelengths selected using the slider bar as shown above. The Mie Simulator provides a tool for calculating the characteristics of Mie scatterers. The tool calculates the spectral dependence of the scattering coefficient, scattering cross section, reduced scattering coefficient, phase function, average cosine of the phase function, and scattering matrix entries for a single or series of wavelengths. These calculations can be run for mono-disperse and poly-disperse distributions based on Lorentz-Mie solution. The tool is also capable of estimating fitting parameters from the reduced scattering coefficient curve and is limited to the characteristics of the far-field scattering pattern. The Mie Simulator algorithm is based on the BHMIE code available from Bohren and Huffman. This is a beta release of Mie simulator GUI we developed for virtual photonics workshops. Documentation and additional resources can all be accessed from the GitHub site.